The "Arbequina" , its name comes from the town of Arbeca, in Segrià, is one of the smallest olives used to produce olive oil. 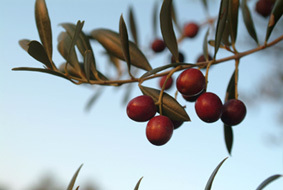 Rather round, green/voilet in color and shinny, maturing very early, it produces a very fine olive oil. If well seasoned, it can also be eaten as a table olive. It is the most widely found variety in Catalonia, the most famous and well known. It comes from a small tree which endures very well the frost and dryness and produces only after 10 to 15 years of maturity. The olive tree has strong roots and well ramify. The roots are differents, depends like it has been planted. If the tree has been planted from a seed, it will has a vertical principal root in the case of the seedling haven't any principal root. This root grows horizontally. In time, the union of this roots with the trunk constitutes the "soca".